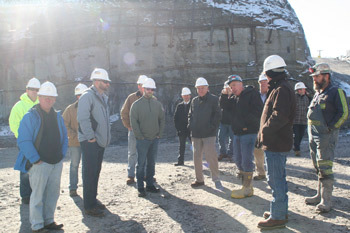 Last week, I toured LCT Energy’s newest coal mine in Acme with some of my House colleagues. The visit gave me a firsthand perspective on how legislation and regulation impact the industry. The next day, I attended a bipartisan forum hosted by the Gas and Oil Caucus at Dominion Energy – Delmont to discuss job creation through ethane storage and plastics in the coming legislative session. Energy employers and building trades officers from western and central Pennsylvania were in attendance. Also, PennDOT Driver License Centers will be closed on Tuesday, Dec. 25, for Christmas, and on Tuesday, Jan. 1, for New Year’s. Customers may still obtain a variety of driver and vehicle products and services online through PennDOT’s Driver and Vehicle Services website, dmv.pa.gov, or through my website at RepWalsh.com. For additional information, click here. For assistance in obtaining or submitting an application for a placard or registration plate, please feel free to contact my district office at 724-929-2655.